Be the first to share your favorite memory, photo or story of Arlene . This memorial page is dedicated for family, friends and future generations to celebrate the life of their loved one. 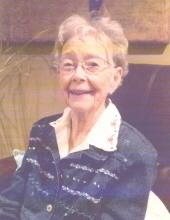 Arlene Wirth, age 96, of Ames, formerly of La Fayette Township in Story County, died Thursday, November 15, 2018, at the Windsor Manor in Nevada. A Funeral Mass will be Tuesday, November 20, 2018, at 10:00 a.m. at St. Cecilia Catholic Church in Ames with Rev. James Secora officiating. Burial will be in the St’s. Peter and Paul Catholic Cemetery, northwest of Gilbert. Friends may call on Monday, November 19, 2018 at the Church in Ames from 5 to 7 p.m. Visitation continues on Tuesday at the Church from 9:00 a.m. until service time. Arlene Viola (Miller) Wirth was born in Vernon Township in Humboldt County on August 26, 1922 the daughter of Magnus and Ellen (Wike) Miller. She attended school in Humboldt County. On January 5, 1942, she married Edward “Bud” Wirth at St.’s Peter and Paul Catholic Church, rural Gilbert, to this union 9 children were born. She was a homemaker for her family, and helped on the family farm. Arlene and Bud moved to Roland in 1978 and then to Ames in 2001. Arlene was an excellent seamstress and enjoyed playing cards. Arlene was preceded in death by her husband, Edward “Bud” Wirth and her parents. She is survived by her five sons, Robert Wirth and wife, Judy, of Gilbert, David Wirth and wife, Denise, of Ames, Steve Wirth and wife, Barb, of rural Gilbert, and Paul Wirth and wife, Kim, and Phillip Wirth and wife, Karen, all of rural Story City; four daughters Mary Hanson and husband, Tim, Sue Berg and husband, Terry, and Joan Wirth, all of Ames, and Jean Grady of Radcliffe; 26 grandchildren; and 32 great-grandchildren; and numerous nieces and nephews. The family requests that no monetary donates be given. Flowers will be accepted. To send flowers or a remembrance gift to the family of Arlene Wirth, please visit our Tribute Store. "Email Address" would like to share the life celebration of Arlene Wirth. Click on the "link" to go to share a favorite memory or leave a condolence message for the family.